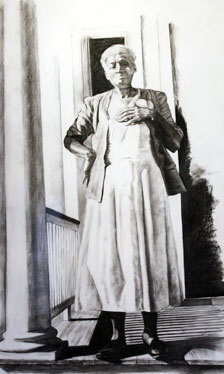 Hodges' "Mary Washington" is in charcoal on paper. Before their illustrious careers, Hawaii's Snowden Hodges and Japan's Ryozo Morishita were humble art school students at the Maryland Institute of Art where they met and became lifelong friends. Iolani Gallery at Windward Community College reunites the two artists, in "East meets West," on view through May 4. 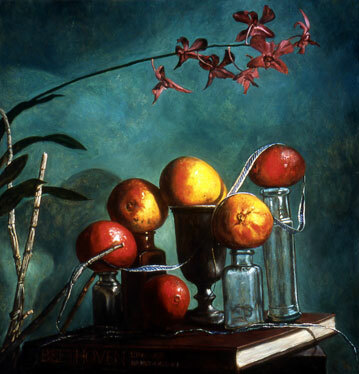 Hodges, an art professor at the college, contributes portraits done in charcoal as well as the oil still lifes for which he's become well-known. Morishita is an art professor in Kyoto and a renowned artist in his country. In the body of work in this show, he utilizes sumi-ink and acrylics on Kumohadamashi paper to create large abstracts. Gallery Iolani is located on the Windward Community College Campus, 45-720 Kea'ahala Road, next to Paliku Theatre. Gallery hours are 1 to 5 p.m. Tuesdays to Fridays and Sundays. Call 236-9155 or visit www.gallery.wcc.hawaii.edu. "It Looked Like the Gleam of Firefly," by Ryozo Morishita, is a work in sumi-ink and acrylic on Kumohadamashi. 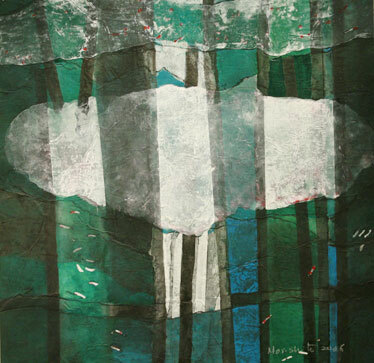 "Four Trees," by Morishita, is a large and dramatic piece.